Since the publication of this piece, two of the pages mentioned in the article have been taken down. Evan Fasciano was born in June 2010. He was born at 30 weeks, just before birth, was diagnosed with harlequin ichthyosis – a rare disease that causes extreme thickening of the skin. Evan has delayed physical development, and as a result, he needs assistance with mobility. His mother, Diane, shares her experiences of raising Evan, along with his younger brother, Cenzo, via her Facebook page and blog. On her pages, Diane Fasciano shares photos of her children, as well as actively campaigning for greater awareness of ichthyosis. Fasciano told BuzzFeed News that the first time she noticed her son’s photos had been stolen was in December 2015. She was alerted by a friend to a post on the page "Your Tattoos Make You A Horrible Mother". The page has become infamous for its shaming of tattooed women and women in general. On it was a picture of Evan, lifted from a blog post Fasciano had written. The Horrors of everyday life for a child who suffers from FIS (fetal ink syndrome, a fictitious condition) extended well beyond how the look or how society views them. These tortured souls lack the proper structure and self esteem which children of pure skinned mothers may provide. This holiday season, I want you to consider opening your hearts and homes to a child who has been abused their entire life. Give them hope for a brighter tomorrow. Even if it costs a horrible inky mother her freedom. Merry Christmas. When she saw the post, Fasciano said she was distressed. "I was absolutely furious and devastated. Not only was his photo stolen and being used to gain attention for their troll site but they were viciously lying and ridiculing his appearance for their sick gain," she said. "I was offended at the thought someone would have the audacity to make claims that a child would be poisoned by a mother's tattoos." BuzzFeed News reached out to the admins of "Your Tattoos Make You A Horrible Mother" for comment. Years before, Fasciano had written about another child with harlequin ichthyosis having their photos stolen by a similar page. In response she created a graphic providing information on the disease. And then in January, BuzzFeed News contacted Fasciano when her son's photo was found on another page, a personal profile called "Elena Moreno" with over 47,000 subscribers. Each time Fasciano has attempted to report the pages and photos to Facebook, she said she has been told they do not "violate Facebook's terms." She said she has had to send multiple emails to the company before the photos were removed. "Facebook has no problem taking down pictures of nursing mothers or naked baby bottoms the first moment someone reports them, so it confuses me when you have to fight to get your child's stolen photo by a troll taken down," she said. This kind of photo theft appears to be a widespread problem affecting a huge number of people on Facebook with disabilities and illnesses. We reached out to people in similar posts found across multiple Facebook pages. Those who responded all said they had had their photos stolen multiple times, and said that each time Facebook was slow or ineffective in its response. One woman, Marit Smith, a 27-year-old from the Netherlands, told BuzzFeed News that her photo was stolen by a profile called "Washington Hiraldo". Smith said she was able to remove it, but Facebook did not take down the page. A day later, however, her photo ended up on the "Elena Moreno" profile that had also stolen Evan's photo. Smith, who runs a blog highlighting the diversity in the disabled community, said she felt weird seeing herself become the victim of something she campaigns against. "When I look at these pages, I know it's just a scam and someone else is posting these photos, but not everyone knows this. And so it does show us in a bad way," she said. "It's also really sad that it seems to happen to the people that try to work so hard to get rid of the idea that a disability is something to be ashamed of, and to be pitied." 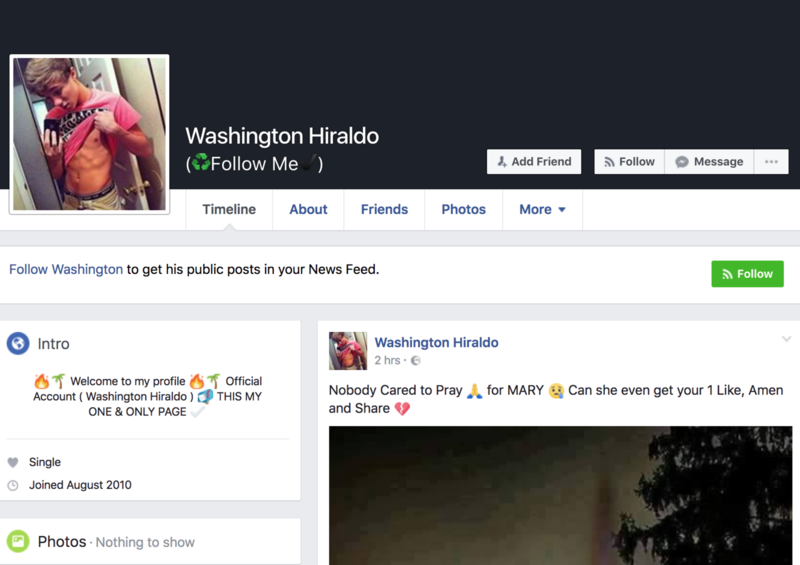 The "Elena Moreno" and "Washington Hiraldo" profiles that took Evan and Smith's photos both have huge followings, but appear to be fake accounts full of stolen photos. 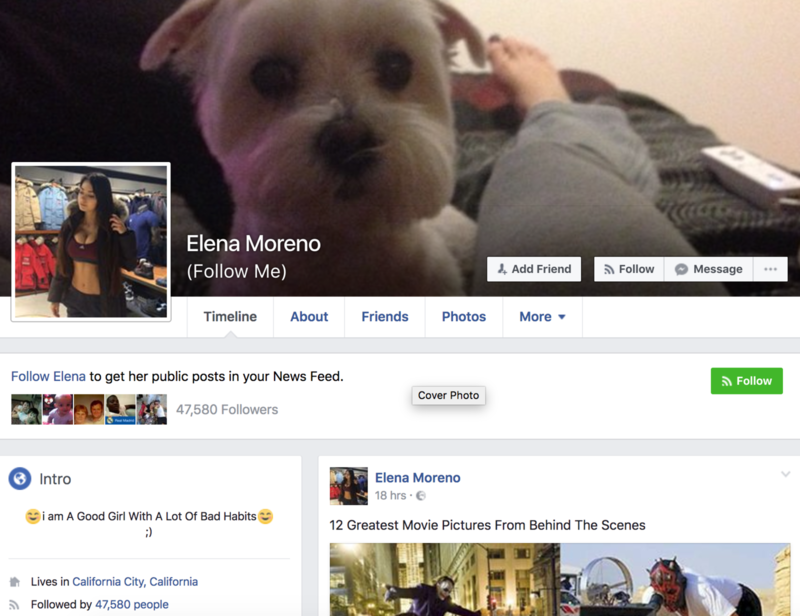 BuzzFeed News actually brought the "Elena Moreno" profile to Facebook's attention in October last year. Sophia Christele Chester, a 32-year-old author from Cambridge, Maryland, had her photo stolen by the Moreno profile. Facebook did not respond to a request for comment at the time. The Moreno and Hiraldo pages appear to be using photos from models, stock images, and pictures from popular social media accounts. Moreno's profile picture appears to actually be a Russian Instagram model named Helga Lovekaty and Hiraldo's profile picture is of a Belgium-based YouTuber named David Rodriguez. BuzzFeed News has reached out to both Lovekaty and Rodriguez for comment. The fake profiles collect photos and then caption them with requests for likes and shares. The pictures are usually taken down within a month or so and then new ones are uploaded in their place. Because the pages have thousands of followers, they are able to build up thousands of reactions and shares with their posts. While commenters flood the stolen photos with messages for the people pictured, praying for them and hoping they get better. A spokesperson for the company said they would look into the activity on the pages flagged by BuzzFeed News and respond shortly. Since the publication of this piece, two of the pages mentioned in the article have been taken down. "Your Tattoos Make You A Bad Mother" remains up.